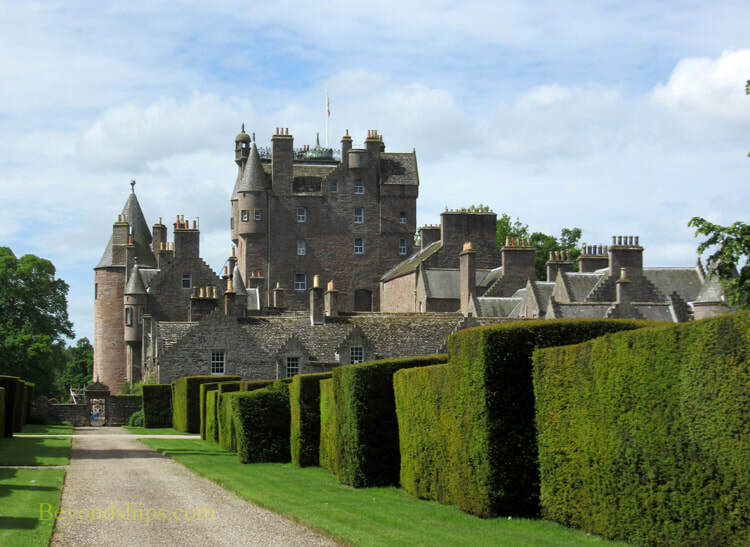 Glamis Castle is a historic stately home with royal associations. It sits in a beautiful park some 80 miles from Edinburgh. (see next page). The land on which Glamis Castle stands was awarded by King Robert II (Robert the Bruce) to Sir John Lyon, his son in law, in 1372. It remains in the same family today. Although it has been much altered and expanded over the centuries the early 15th century central tower remains the nucleus of the castle. 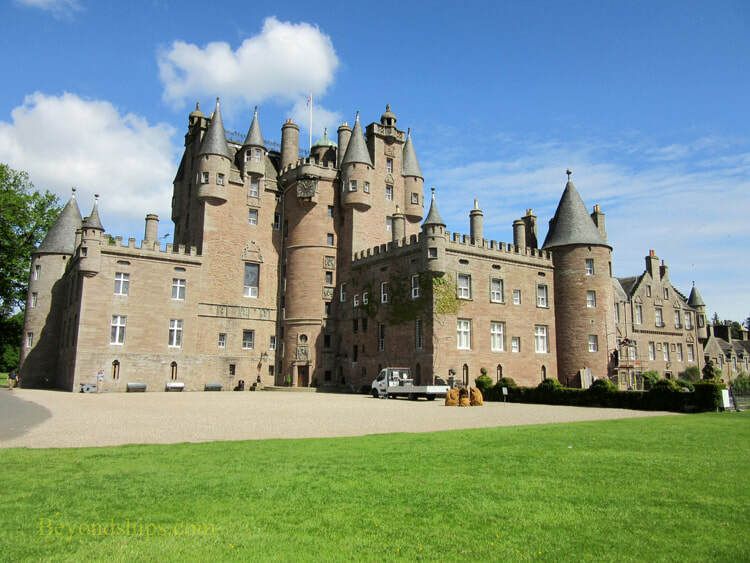 In the 16th century, Glamis became a royal residence when King James V seized the castle. However, the dispute did not last long and Glamis was returned to the Lyon family in 1543. Patrick Lyon was created Earl of Kinghome in 1606. Seventy years later, the title “Earl of Strathmore” was added. As a result, the title became Earl of Strathmore and Kinghome. The family supported the Royalist cause in the Civil War and so during Cromwell's Commonwealth of England, Scotland, soldiers were garrisoned at Glamis. After the Restoration, the Earl returned to find the castle almost unihabitable. He therefore commenced to transform the structure into a Rennaissance Palace. Further work was done during the 18th century. As a result, the house looks more like a French Chateau than a medieval fortress. In 1753, the 9th Earl married married Mary Eleanor Bowes, heiress to a coal mining fortune. Since then, the family has been known by the name Bowes-Lyon. The most famous Bowes-Lyon to have lived at Glamis was Queen Elizabeth, the Queen Mother. The daughter of the 14th Earl, she spent much of her childhood at Glamis. In 1923, she married Albert, Guke of York, who later became King George VI. Their daughter, Princess Margaret, was born at Glamis. 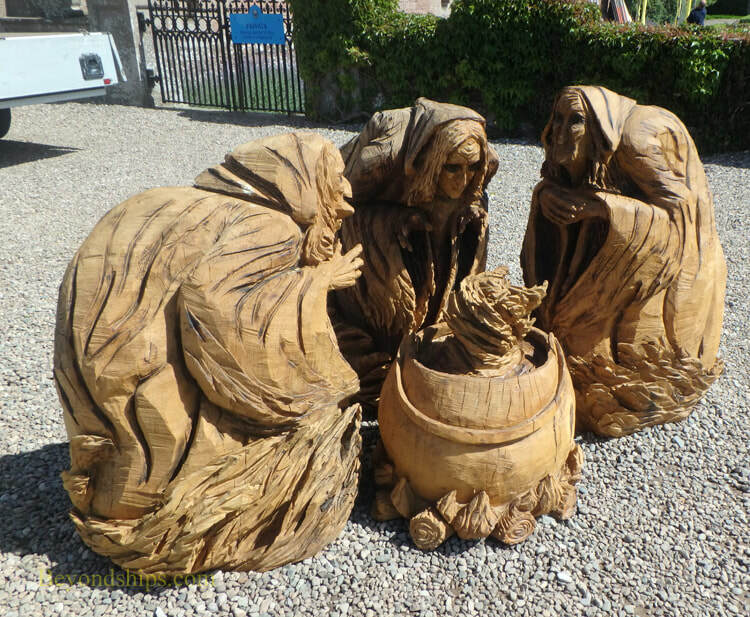 Above: Wooden carvings of the witches from Shakespeare's Macbeth. ​There are numerous legends about Glamis. Perhaps the best known of the tales about Glamis comes to us from William Shakespeare. In Macbeth, the title character is the Thane of Glamis and his castle is the place where he muders King Duncan. The story, however, is the product of the Bard's imagination, which may have been inspired by reports that King Malcom II was murdered at the royal hunting lodge that once stood where the castle is now. Glamis is also saidand Ireland to be the most haunted castle in Britain. Its most famous ghost is the 16th century Lady Janet Douglas. She was married to Lord Glamis but was also a member of th Douglas family who were enemies of King James V. The King accused Lady Janet of conspiring with her brothers against him. When no evidence of the conspiracy could be found, the King had her burnt at the stake as a witch. There have been many sightings of her at Glamis. A seat in the chapel is permanently reserved for her. Another ghost seen over the years is that of Earl Beardie. The story goes that he wanted to play cards on a Sunday but no one would play because it was the Sabbath. In frustration, he asserted that he would play cards until Domesday with the devil himself. Shortly thereafter a mysterious stranger appeared at the door asking if Earl Beardie still wanted to play cards. Allegedly, Beardie is still playing cards in a walled up hidden chamber in Glamis although he occasionally takes a break to scare visitors. This brings us to the Monster of Glamis. This tale does not involve the supernatural but is nonetheless strange. Supposedly, the first born son of the 11th Earl was born so hideously deformed that it was decided that he could not go out in public. Therefore, he was reported to have died shortly after his birth and was kept in a hidden chamber in the castle. No one but the Earl, his heir and the estate manager were allowed to know the secret. However, from time to time, a strange figure was seen around the castle at night. What gave this tale such currency in Victorian times was that the family appeared to take it seriously. For example, the Earl paid for one workman who saw the monster to emigrate to Australia. Visitors to the castle, see the interior on guided tours. Inasmuch as the castle was built over several centuries the public rooms range from medieval to Victorian Gothic. Since it is still the home of the Earl and his family, the rooms are fully furnished with antiques and items relating to the Bowes-Lyon family. 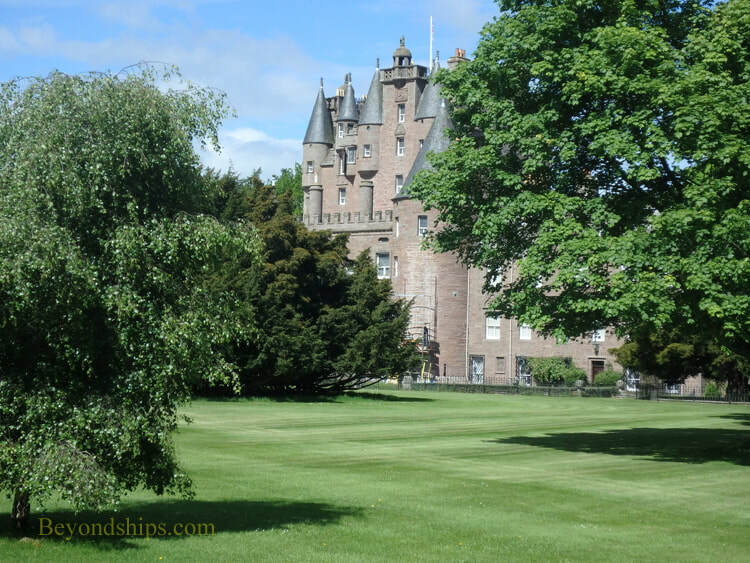 For more information on visiting, see the Glamis Castle website.